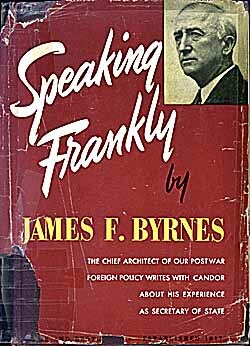 Established in 1948, the Foundation is financed from the proceeds of Mr. Byrnes' books, Speaking Frankly and All In One Lifetime, as well as contributions from friends and admirers of Mr. and Mrs. Byrnes. Also, the Foundation completed a five-year Living Memorial campaign in 1995 in which former scholarship recipients contributed $250,000 for use towards scholarships. Judge Donald S. Russell, a longtime friend and professional associate of Mr. Byrnes, was named the first trustee of the Foundation. Miss Cassie Connor, Mr. Byrnes' executive secretary for much of his political career, succeeded Judge Russell. The purpose of the Foundation is to assist students with the financing of a college education. In order to qualify as a candidate for a Byrnes Scholarship, however, the student must have lost either one or both parents and be a resident of South Carolina. In 1968 the Foundation was incorporated as a nonprofit organization with three directors: Miss Connor, G. Richard Shafto, and R. Alex McCullough. Since that time, several distinguished South Carolinians have served on the board, including Robert L. Sumwalt, Sr., W.D. Workman, Jr. and General William C. Westmoreland. The Foundation will be forever indebted to J. Richard Shafto and W.D Workman, Jr. for the leadership they provided during the years of transition after the death of Mr. Byrnes. In 1964 a separate voluntary organization, The Byrnes Scholars, was formed by recipients of Byrnes Foundation Scholarships. It functions as a supporting arm to the Foundation. More than 1,000 James F. Byrnes Scholarships have been awarded since 1949 -- young men and women who constitute a living memorial to "Mom" and "Pop" Byrnes. There are usually 40 Byrnes Scholars attending the college of their choice during a given school year. The annual stipend now stands at $3,250. While Governor and Mrs. Byrnes were living, they strove to provide personal attention to every Byrnes Scholar; and in their absence, the directors of the Foundation and the executive secretary attempt to do the same. While they realize that no person or group of people can take the place of a lost parent, alumni and scholars like to refer to themselves as a family. Any qualified high school student who is interested in applying for a Byrnes Scholarship should see his guidance counselor. Application packets are available for downlad from this website from November through January, which covers the application cycle. For more information contact the Byrnes Foundation.